If you're recovering from medical treatment, have a chronic illness or are disabled, you may need help with life's daily activities. 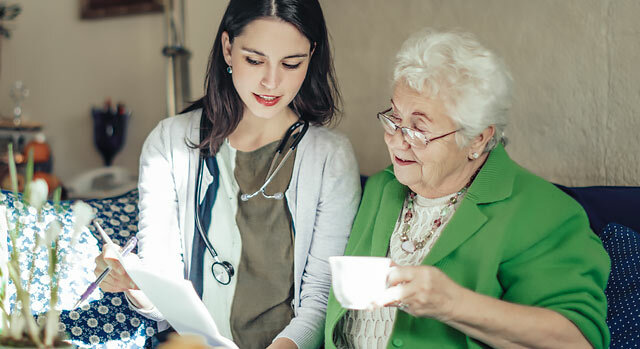 Corona Regional Home Health offers the services you need to ensure continuous high-quality medical care while you remain in your home and maintain your independence. Our program is designed to provide comprehensive care and education to you and your family through intermittent visits from skilled healthcare professionals. Whether you need short-term home care while you recover from an injury or illness or long-term care because of a debilitating disease, our program can help you live in your own home with maximum independence. Home health services are available to anyone who has a doctor's order and who needs intermittent skilled nursing or therapy services. Medicare and MediCal and most private insurance, managed care and Workers' Compensation programs typically cover home health services. In addition, Corona Regional Home Health has staff members on call 24 hours a day, seven days a week. Spanish speaking staff members are available. Nurses monitor and assess your improvement and provide your physician with reports of your progress and outcome. In addition, we coordinate the ordering, delivery and setup of necessary equipment and supplies to help ensure that you receive uninterrupted care. To receive more information about Corona Regional's Home Health services, please call 951-734-3650.